Winter is coming, unfortunately and we've had a taste of the cold, bitter weather already here in Kansas. I'm not a cold weather person at all and would much rather look at white sandy beaches than snow. But it's inevitable and I've accepted that. So might as well look chic while bundled up! 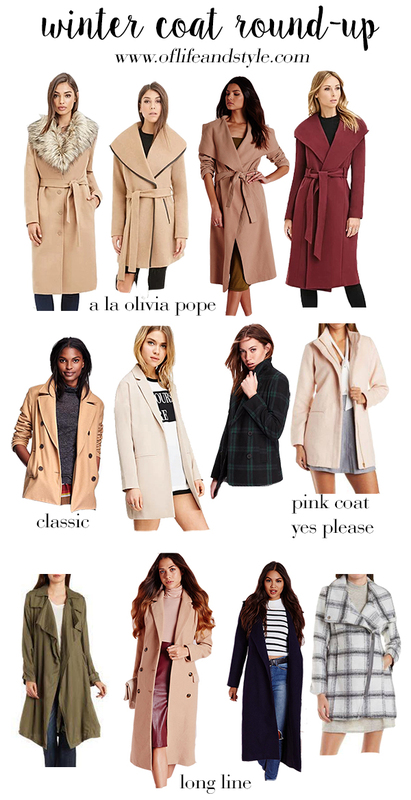 Today I've rounded up some of my favorite winter coats that will keep you warm and stylish this season. And all are under $100! I've actually purchased the black and camel belted and the pink coat. I'm so excited to wear them and they make the cold a little more bearable. The black and camel is from, would you believe it, Forever21 for under $70 and the pink is from Charlotte Russe that I got for $30 while on sale! SCOOOOREEEEE! I have the short classic camel peacoat from Old Navy and I love it! It's warm and stylish and will never go out of season. And it comes in a whole lotta colors too so if camel isn't your color you can pick another! Or just get them all and have all your bases covered! Haha! Do you have your winter coat? Where do you buy your winter outerwear? Leave a comment sharing!